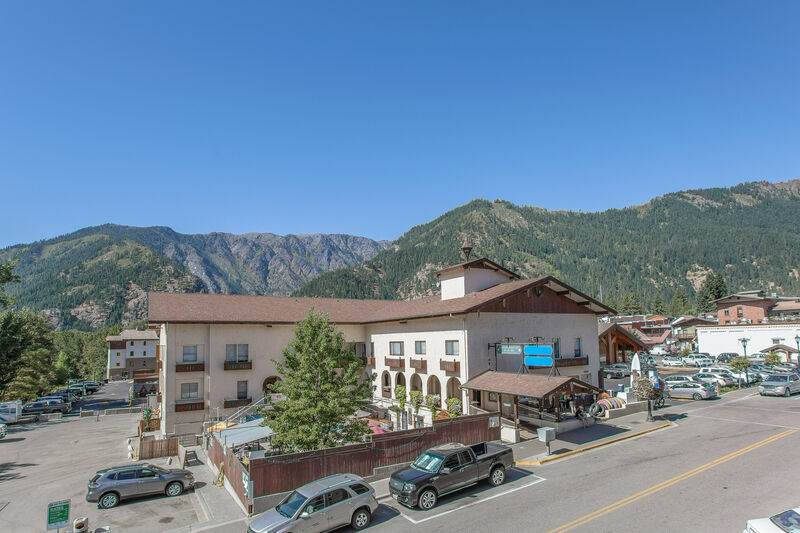 A beautiful 2 bedroom condo touched with European-styled elegance, Grand View overlooks the stunning mountains, yet it's conveniently located just a block from downtown Leavenworth. Discover how easy it is to enjoy a perfect vacation getaway that's close to home, yet so uniquely European in flavor that it seems to be a world away! The Grand View Suite, located just a block from downtown Leavenworth in the recently constructed River Park Condos building, has all the European elegance and comfort you'd expect to find in Bavaria, in a gorgeous mountain setting that's only one block from the festivals and shops. Tastefully furnished and decorated with elegant style, this two bedroom, 2 bath condo is fully equipped, and features the lovely earth tones of granite, tile and wood. The fully equipped kitchen, with granite counters and all new appliances, make meal-making a delight. A jacuzzi tub in the master bath is an amazing place to relax. Then, you can unwind with a movie on one of the big screen TV's, or simply enjoy a good book in front of the fire. There's just nothing like savoring your morning coffee on the wrap-around deck overlooking the breathtaking mountains while sounds of the rushing river calm and restore and the little village wakes around you. The Grand View Suite is a perfect place for your next stay in the Bavarian village! We loved this condo. It is very close to town yet far enough away that it feels quaint and quiet. Great view of the river in the winter time and close to the riverfront park. I have stayed here a few times now and it is by far my favorite place to stay in Leavenworth!! Everything you could need is stocked in the condo. Wonderful place to stay! We absolutely loved the condo! We absolutely loved the condo! Everything was perfect, from the security of the private parking garage to the condo itself, that was fully equipped with everything we could have possibly needed! It honestly doesn't make sense to stay in a hotel when you have an opportunity like this! Beautiful views, beautiful property! I really enjoyed sitting on the covered patio/deck too!! We'll be back!! Thank you!! Location is perfect. Loved being in heart of city center. There were so many things we loved about the condo. It was perfect for our family of 5. We LOVED being in town and so close to the park! The location is amazing EXCEPT when the restaurant across the street has live music. It's very loud, even with all the windows and doors shut. It was hard to watch a movie and sometimes even have a conversation. The music stopped at 10, so going to sleep was not a problem. It was a bit annoying, but everything else about the condo was amazing, we would probably stay here again. I just wish we would have known ahead of time, which is why I'm writing it in the review...so others are aware. The property management company was wonderful to work with and I would definitely stay at one of their properties again! Great spot. Right in town. It is a corner unit with lots of windows. Lots of light. Super clean. Big deck but it was to cold for us to sit out there this trip. We will be back. Thank you.